It seems that, lately, every time you turn on the TV you see commercials for probiotics. They’re in yogurts, supplements and now even fruit juice! This might get you wondering: WHAT are these probiotics we keep hearing so much about, and do we really need them? Probiotics are LIVE bacteria that are important in health and may be linked with gut or gastrointestinal health. I know what you are thinking: “BACTERIA?? ?” Yes! Probiotics are a good bacteria (often called “live cultures”) that are naturally found in your gut. Your body is full of bacteria, both good and bad, that you need plenty of to keep your digestive system working properly. In a normal, healthy gut environment, the amount of good bacteria (probiotics) and bad bacteria (which can cause tummy problems if you have too much) are kept in balance. Occasionally this bacteria can get out of balance (after taking antibiotics, for example) and we may have more of the bad bacteria and less of the good. Taking additional good bacteria, or probiotics, can help get that ratio of good and bad bacteria in balance again. The two most prevalent strains of the good bacteria, Lactobacillus and Bifidobacterium, can be found in most dairy foods and fermented foods as live and active cultures. Probiotics have been used for management of tummy issues, such as relieving symptoms of irritable bowel syndrome, preventing specific allergy symptoms, reducing symptoms of lactose intolerance and more. Recent nutrition research has looked into how probiotics can impact overall health. There is promising research that probiotics may promote weight loss or reduce risk of disease such as diabetes or hypertension. Research on gut bacteria is very new, however, so researchers have not been able to give exact recommendations on whether probiotics really improve health risks, and if so, at what dose. 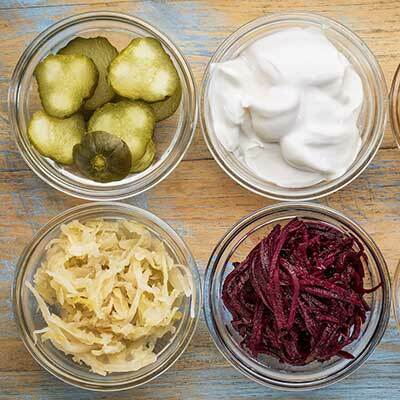 Fermented dairy foods including yogurt, kefir and aged cheeses. Some nondairy foods including kimchi, sauerkraut and miso. Probiotics are a great (and tasty!) way to keep that gut bacteria in balance. Besides overall gut health, there is new and emerging evidence that our gut bacteria may play a bigger role in our overall health, so stay tuned for more.